South Africans must “support and defend" Public Enterprises Minister Pravin Gordhan as a matter of duty following relentless verbal attacks on him from the opposition Economic Freedom Fighters (EEF) party, President Cyril Ramaphosa has said. Ramaphosa was speaking on Sunday evening at the biannual congress of the Gauteng Province’s chapter of the South Africa Jewish Board of Deputies, where Gordhan was in attendance. The event also celebrated the centenary of former President Nelson Mandela’s birth. The attacks came to a head during Gordhan’s appearance before the judicial commission of inquiry to give evidence into state capture last week. During the week, the EFF and its supporters staged noisy protests outside the hearing hall against the minister, alleging that he was also corrupt because he allowed his daughter to carry out business transactions when Gordhan was finance minister. The minister denies this. Defending the minister, Ramaphosa said those attacking Gordhan were "deeply embedded in what was going wrong in our country". He did not mention the EFF by name. But EFF leader Julius Malema referred to Gordhan as "a dog of white monopoly capital" and "corrupt," saying he was in the "same WhatsApp group" as former president Jacob Zuma. 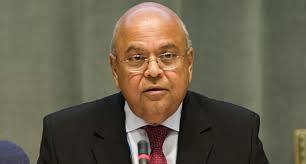 "How can Pravin be a fruit of a rotten tree and not be rotten himself? Because Pravin is in the ANC. Why do you say on the one hand the ANC is corrupt but on the other hand Pravin is different?" Malema added. Ramaphosa, however, insisted during his speech to the Jewish group: “Our task is to support and defend people like Pravin Gordhan and a number of others. We should stand behind them because what they are seeking to do is to rid our country of the culture of corruption which has seeped into the sinews of the body politic."